A New Spin on Fitness! From beginner to advanced, watch your confidence soar as you rediscover your grace, power and natural beauty! Elevate Your Fitness! Learn the art of Aerial silks. Part acrobatics, part gymnastics, part Pilates, all an amazing workout. Take Your Yoga Practice to New Heights! 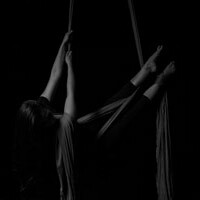 Aerial yoga uses the silk swing to support your body so you can attain optimal alignment. Bachelorette and Pole Parties at The Pole Room are anything but ordinary! Make your event absolutely unforgettable! Receive exclusive promotions, news, and updates from The Pole Room. These classes may/will dramatically increase your chance of pregnancy. So take extra precautions with birth control or planned parenthood. Side effects may also include, but are not limited to: Increased libido, friskiness x10 (not just in the bedroom), DUI’s (that’s “Dancing Under the Influence”), and increased odds of divorce or separation from partner or spouse. Not all women experience these side effects while enjoying The Pole Room…most women are thrilled and enjoy their endless orgasms, experience clearer skin and beautiful body tone, have better hair days, and enjoy a higher quality of life than non-pole users. So enter at your own risk…and enjoy!